It’s that time of year again; Christmas time in Las Vegas! We might not have snow, but we sure do have a lot of fun things to do for families. From Holiday light shows to Christmas parades, music concerts, and Santa himself, Las Vegas has a whole lot of fun stuff going on this time of year. Just because we live in the desert, doesn’t mean we can’t do Christmas! Here is our annual list of the top Christmas events, holiday light shows, and Christmas time attractions in Las Vegas. The Glittering Lights Show is one of the coolest holiday light shows in Las Vegas. 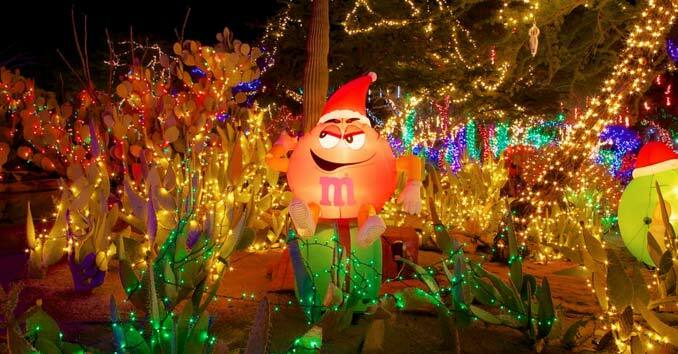 It features a Las Vegas style array of holiday lights, more than 400 animated displays, and Christmas music. 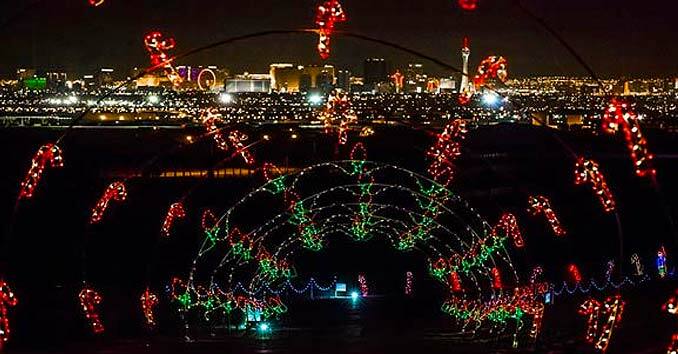 The Drive-Thru Light Show features more than 3 million Christmas lights that are displayed throughout the 2.5-mile Las Vegas Speedway course. Glittering Lights has entertained more than 2.2 million people over the past 15 years. The Glittering Lights Show is located at the Las Vegas Motor Speedway ( 7000 Las Vegas Blvd. N Las Vegas, NV 89115) and is open from November 9, 2018 – January 6, 2019. 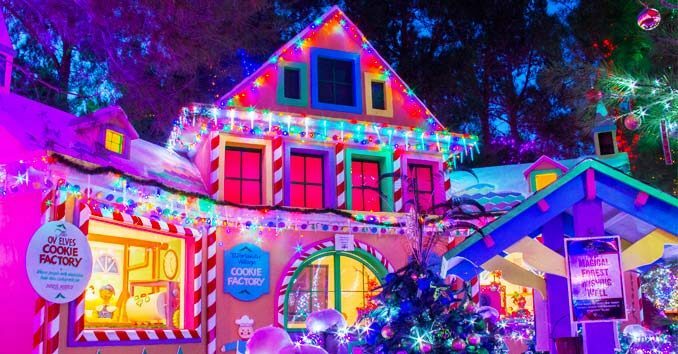 The Opportunity Village Magical Forest is an annual holiday tradition that brings over 150,000 people out to celebrate Christmas in the Magical Forest. The Magical Forest is a beautiful winter wonderland that will have you feeling the holiday spirit right here in the desert. Stroll through hundreds of Christmas displays and decorated trees, ride the Forest Express passenger train & have your photos taken with Santa while enjoying nightly entertainment. The Magical Forest is open from November 23, 2018 – December 31, 2018 . The park opens nightly at 5:30 PM. Celebrate the 25th Anniversary of the Cactus Garden Christmas Display at the world famous Ethel M Chocolate Factory in Henderson. Ethel M’s Holiday Cactus Garden is an annual Las Vegas Christmas Tradition that features a breathtaking display of more than half a million lights, decorating over 300 unique species of desert plants and cactus. From chocolate sculptures and Ethel M Chocolate creations to Santa Claus himself, the three-acre botanical cactus garden display is unlike anything else you will see in the country. This year the entire Ethel M Chocolate factory was renovated for the coming holiday season. 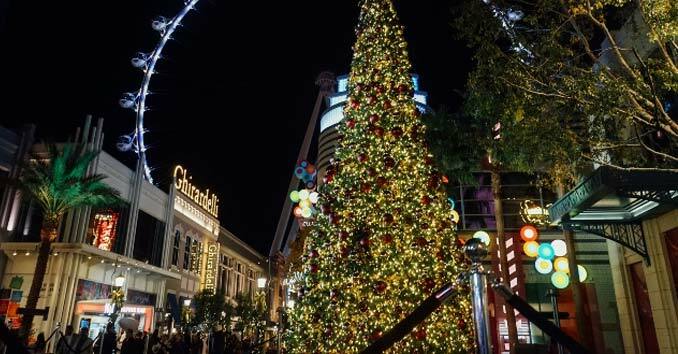 The LINQ Promenade is hosting a number of Holiday events , starting with a tree lighting ceremony at the Fountain Stage. The festivities continue through the holiday season with multiple holiday shows along The LINQ Promenade featuring singers and dancers, beginning Dec. 1. Get in the holiday spirit with free entertainment, family fun and “snow,” even if it’s still 65 degrees out. The LINQ Promenade holiday shows run Thursday through Sunday evenings, starting Dec. 1. 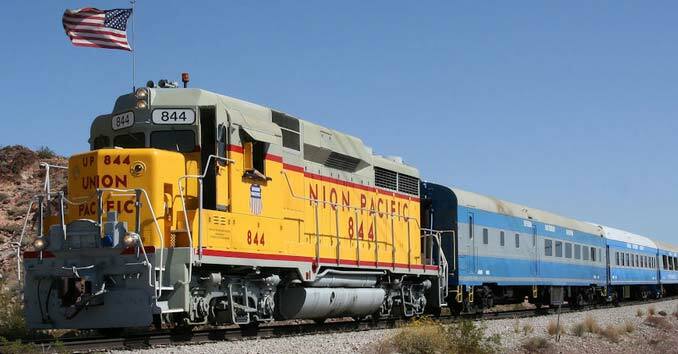 Ride the 17th Annual Santa Train with Santa and Mrs. Claus on the Nevada Southern Railway. The Santa Train is a ten-minute ride on a real five passenger car train that rolls through the desert of the historic Boulder City, Nevada. The route follows a 3.5-mile section of track, through the Eldorado Valley, that was laid in 1931 when the Hoover Dam was under construction. Tickets are $6 per seat and can be purchased at www.nevadasouthern.com. The Santa Train is located at the Nevada State Railroad Museum at 601 Yucca Street, Boulder City, Nevada 89005. Parking is available adjacent to the station. 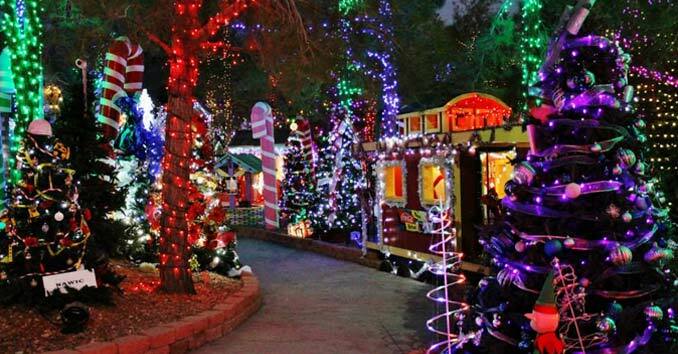 Experince the holiday magic at the Springs Preserve with train rides to Santa’s magical village and festive activities including photos with Santa, holiday crafts, cookie decorating, holiday stories, a nutcracker display and more! This special journey will include all of the quintessential holiday trimmings along the way—from snow to hot cocoa. It’s a family-fun winter wonderland with departures 12 times each day, every half-hour from 12pm to 6pm. Please arrive 15 minutes prior to your scheduled departure time. 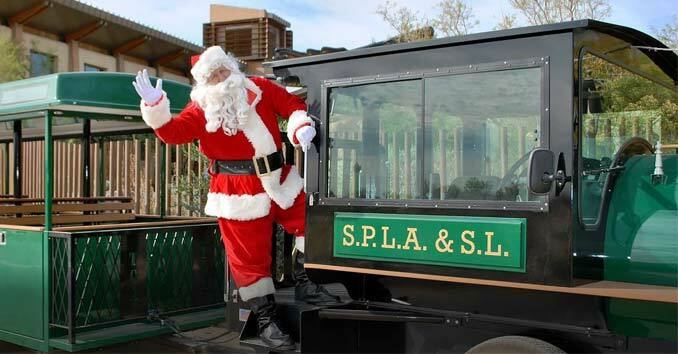 The Springs Preserve Holiday Express experience is approximately 1 hour and 20 minutes. The NFR Cowboy Christmas Show returns to the Las Vegas Convention Center for a ten-day Christmas Extravaganza. 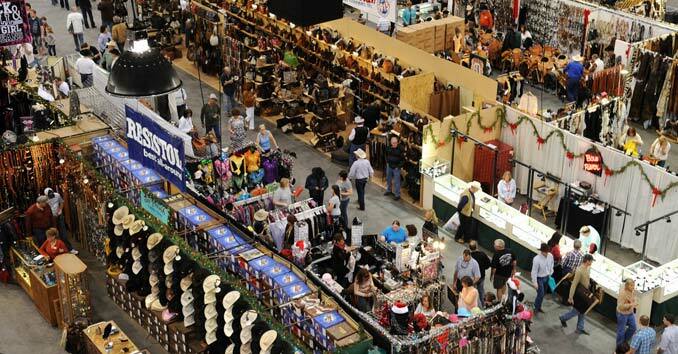 Cowboy Christmas features over 440,000 square feet of vendor booths filled with the best in cowboy gear, gifts, and western fashion. The show features 400 plus Cowboy and Western suppliers, Dozens of rodeo stars signing autographs, and plenty of interactive activities for rodeo fans of all ages. The gift show is a great place to take the family, especially if you have kids. The show is at the Las Vegas Convention Center from December 6, 2018 – December 15, 2018 . The Expo is open daily from 9:00 am – 5:00 pm and admission is always free. 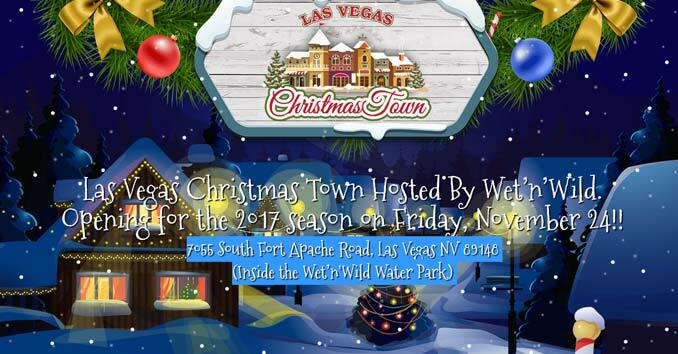 Get wrapped up in the holiday spirit at Las Vegas Christmas Town at Wet’n’Wild Las Vegas. The Event runs from November 23 – December 31 (*Closed Christmas Eve and Christmas Day) and features one-of-a-kind entertainment and attractions. Las Vegas Christmas Town visitors also have the opportunity to dine on delightful treats and interact with classic Christmas characters. Tickets are just $20 and include unlimited one-day access to all attractions and entertainment making Christmas Town the best value in Las Vegas! Town Square Las Vegas hosts a Holiday Nights & Lights Community Concert every Thursday Night in December. Local community groups sing and demonstrate the spirit of the season. Once the show wraps up, celebrate the holidays with Snow in the Square at Town Square Park. 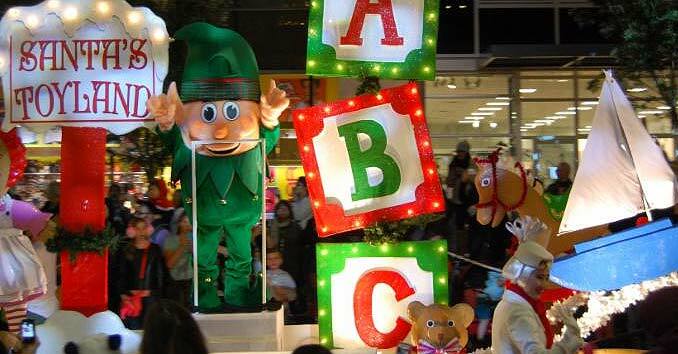 Each show lasts 10 minutes and is choreographed to everyone’s favorite holiday music. Town Square, 6605 S Las Vegas Blvd. Las Vegas, NV. 89119. Santa arrives at the Fashion Show Mall on November 17, 2018. The Adventure to Santa Experience runs from November 17 to December 24, 2018. Don’t miss the easiest way to visit Santa—just reserve your time and skip the line! Save $5 on photos when you book between Monday and Wednesday (through December 9th). Reservations and photo purchases are not required to visit Santa. Celebrate the holidays at Downtown Summerlin’s Grand Celebration + Santa’s Arrival on Friday, November 18, 2018! 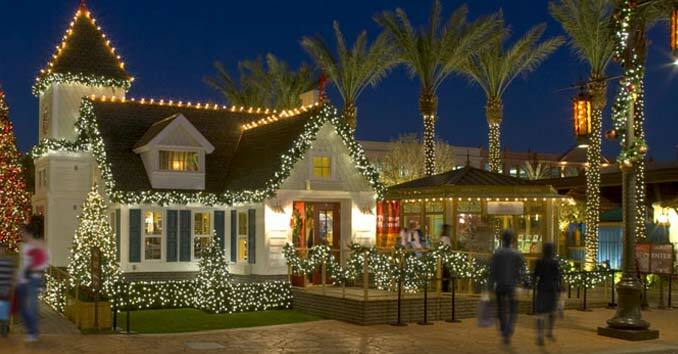 Enjoy a magical family-friendly holiday parade through the streets of Downtown Summerlin as we welcome Santa to his BRAND NEW Winter Wonderland Chalet with a festive light show at the Macy’s Promenade! November 18th – December 15th: Fridays & Saturdays at 6 p.m.
December 16th – December 24th: Nightly at 6 p.m. The popular annual holiday parade at Downtown Summerlin features a magical family-friendly spectacle of floats, toy soldiers, snowflake princesses, nutcrackers, dancers and characters through the streets all set to holiday music. All shows are free and open to the public. 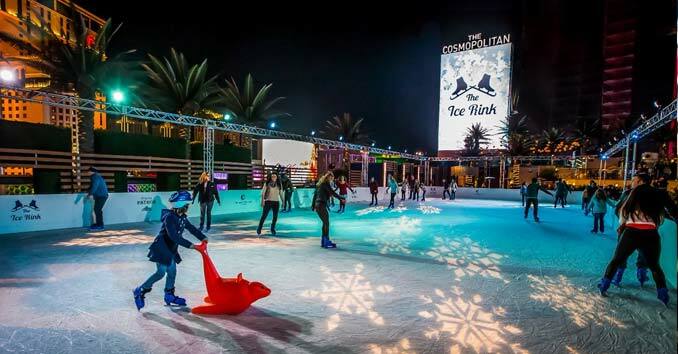 Bring the whole family to the Cosmopolitan this winter to Ice Skate on top of the Las Vegas Strip. Each holiday season, the Boulevard Pool at The Cosmopolitan transforms into a winter wonderland high above The Las Vegas Strip. At The Ice Rink, you can skate across 4,200 square feet of real ice, roast s’mores by the fire, and indulge in seasonal food and beverage offerings. 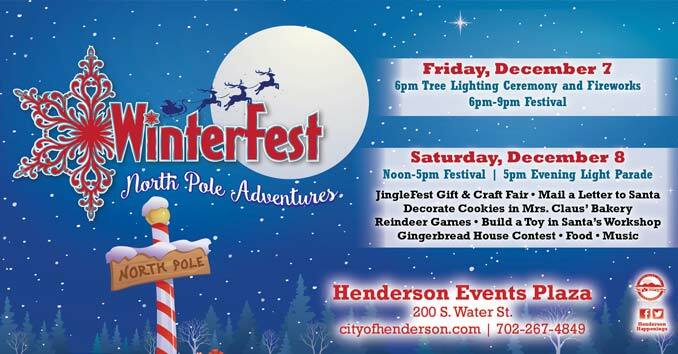 WinterFest is a family-friendly adventure that starts with official Henderson tree-lighting ceremony with Mayor Debra March and Santa. The tree lighting ceremony is followed by a fireworks display. The two-day festival, which runs December 7th – December 8th, includes a gift and craft fair, food vendors, entertainment and an activity area where children can decorate cookies, mail a letter to Santa and build a toy in Santa’s workshop. The event is topped off with a spectacular evening light parade. WinterFest is open to all ages. Friday night festivities include the opening of the holiday season with a tree-lighting ceremony and festival. Saturday’s festivities conclude with our fabulous Evening Light Parade in the Water Street District. 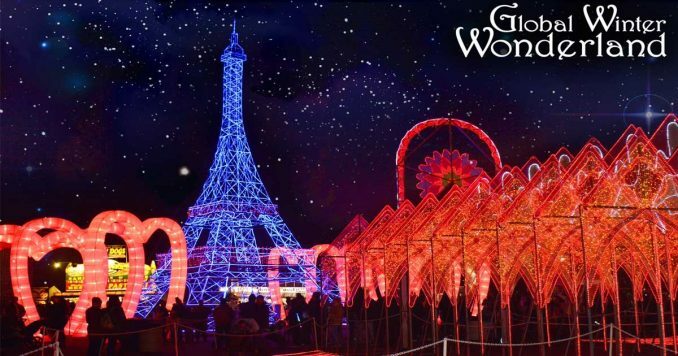 Global Winter Wonderland, at the Rio Hotel and Casino, is a Holiday festival that celebrates multi-cultural collaboration and celebration!